Since the purpose of this blog is to highlight the Adirondack lifestyle, I frequently post pictures in an attempt to capture the natural beauty of the Adirondacks. An appreciation for natural beauty is a basic characteristic of someone who chooses to live or vacation in the Adirondacks. I have so many favorite views of the Adirondacks, it is sometimes difficult to choose which one to mention. Today's view is one of my every-day eye candy indulgences. 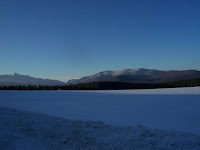 This photo was taken from the intersection of NY Route 73 and the Adirondack Loj Road, on the way into the Village of Lake Placid. The Adirondack Loj Road ends at one of the gateways to the High Peaks hiking trails, at the Adirondack Mountain Club's facilities. The Loj Road is a popular spot for photo ops of the incredible vistas across the potato fields. I enjoy this view every day on my trips in and out of the Village of Lake Placid. It is a little distracting on bike rides when I have to pay attention to the road since it is a relatively fast downhill; I'd rather be checking out the views. Here is a link to today's photo album of Loj Road views. It's a beauty day here in the Adirondacks.